I don’t know about you but this time of year I am scheduling in desserts… every night. A girl needs a pick me up through the slush & snow & cloudy skies. This doesn’t mean I’m sacrificing my therapeutic diet. I have been doing another AIP elimination since September and feeling better than ever. I don’t want to stop! My solution is always to make my sweets & treats work for me, not against me! If you haven’t already read about the benefits of bee products for autoimmune disease, follow the link and read up! After doing the research for that article, I knew I had to get more raw honey in my life! So I started experimenting with AIP treat recipes only using raw honey. I grabbed a huge jar of buckwheat honey from the local farmers market and went to work. 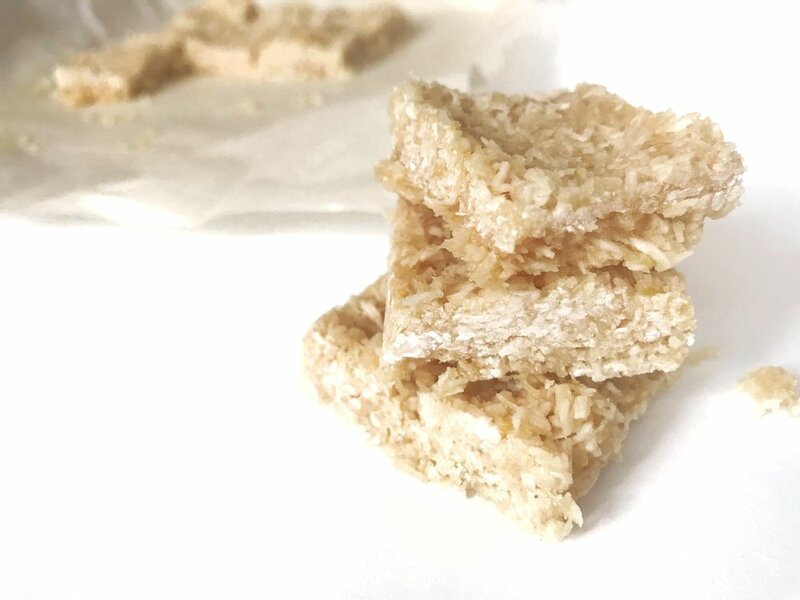 The treat I’m sharing with you today is a fantastic way to satisfy a sweet tooth, giving you a little boost of serotonin, while containing enough fibre to mitigate blood sugar impact. I find that knowing I have a satisfying AIP sweet treat waiting for me at the end of the day, not only makes it easier to stick to the full AIP elimination throughout the day, but also prevents binge eating a bunch of little things at the end of the night - as is a common pattern for me and many of my clients. Meanwhile, you’re getting all those benefits that raw honey can bring, making this dessert potentially HELPFUL for those with autoimmune disease. 1) Combine all ingredients in a large mixing bowl and mix well. 2) Line a pan with parchment paper. Pour the batter into it and press firmly, evening out the top. 3) Place in freezer. Once it’s firm, remove and cut into bars. 4) Satisfy that sweet tooth! LEAVE A COMMENT if you have any questions about the recipe! Let me know how you use your raw honey or if you have an requests for a specific kind of recipe. I’m here for YOU!